The lineup of festival experiences has been announced for the eighth annual Monster Energy Welcome To Rockville, Friday, April 27, Saturday, April 28 & Sunday, April 29, 2018 at Metropolitan Park in Jacksonville, FL. Florida’s Biggest Rock Experience grows to three days in 2018 with Foo Fighters, Ozzy Osbourne, Avenged Sevenfold, Queens of the Stone Age, Billy Idol, Godsmack, Stone Sour, and Five Finger Death Punch leading an incredible talent lineup not seen at any other U.S. rock festival. 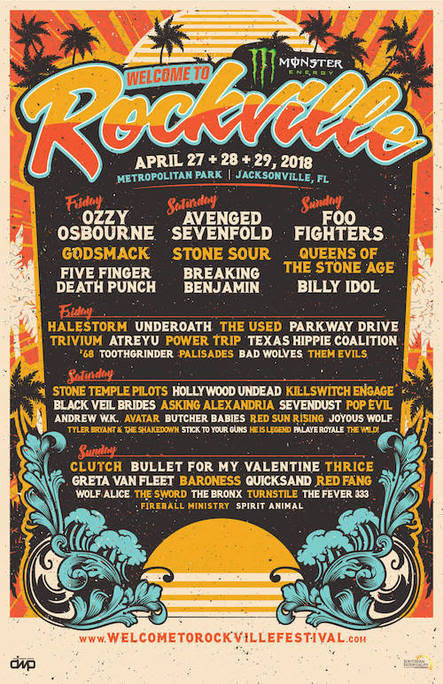 Monster Energy Welcome To Rockville tickets, VIP packages, as well as hotel and camping options are selling fast, but limited quantities still remain on sale now at www.WelcomeToRockvilleFestival.com. In addition to performances from top music artists, attendees at this year’s Monster Energy Welcome To Rockville will enjoy a variety of onsite food and beverage experiences, as well as sponsor activations. Grub Zone: Food and beverage options will be provided by Southern Hospitality Concessions LLC, DWP’s affiliate concessionaire. Patrons can enjoy some of Jacksonville’s local favorite restaurants, cuisine, and food trucks such as: Mojo’s BBQ, Pele’s Wood Fired Pizza, Indochine Thai Cuisine, Island Noodles, Guana Bana Ice Pops, Brucci’s Pizza, Cely’s Philippine Cuisine, Knuckle Sandwiches, Grumpy’s Homemade Ice Cream, Dos Vatos Tacos, What’s The Catch Fish Tacos, Chinchilla Eatz on the Streets, Mambo on Ruedas Cuban, Wingin It, Cousins Maine Lobster, BC Tacos, Mama’s Greek Cuisine Food Truck and much, much more! Beverages: Festivalgoers 21+ can enjoy a variety of beverages at one of the festival’s many bar locations. Specialty experiences include Caduceus Cellars & Merkin Vineyards Wine Garden (owned by Arizona resident Maynard James Keenan, co-founder of international recording acts Tool, A Perfect Circle and Puscifer) and the Heavy Tiki Bar (a tropical oasis filled with killer island cocktails and shade). Guests can also stop by Mrkt N Jolt to grab a hot coffee, cold brew or other sundry items. Bud Light, Samuel Adams Sam ’76, and Jack Daniel’s will be available throughout the festival grounds. Bud Light: Introduced in 1982, Bud Light is a premium light lager with a superior drinkability that has made it the best-selling and most popular beer in the United States. Bud Light is brewed using a blend of premium aroma hop varieties, both American-grown and imported, and a combination of barley malts and rice. The light-bodied beer features a fresh, clean and subtle hop aroma, delicate malt sweetness and a crisp finish that delivers the ultimate refreshment. For more information, visit www.BudLight.com. f.y.e. : f.y.e. 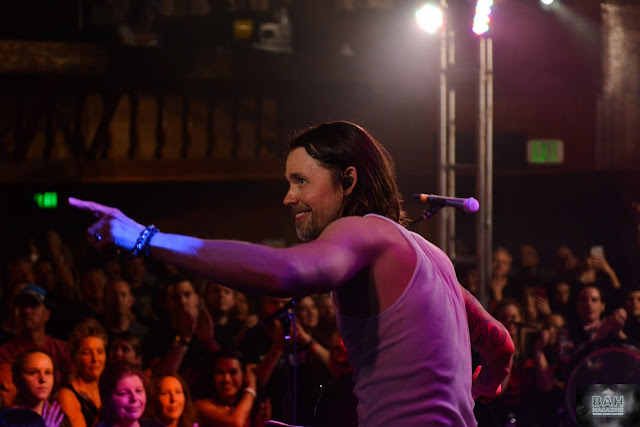 will be hosting the ultimate fan & artist interactive experiences throughout the festival! f.y.e. is the only place at the festival to get all your favorite band's music — and maybe even get to meet your favorite Monster Energy Welcome To Rockville performer! 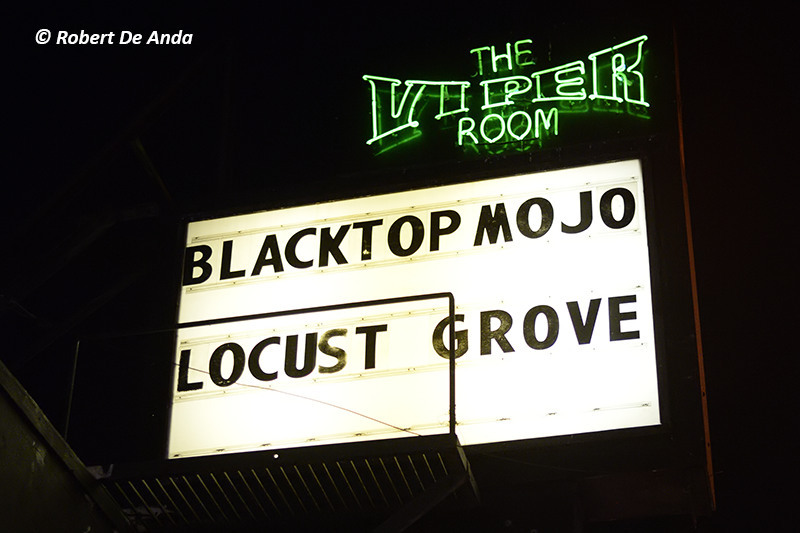 Check back for updates on artist meet & greet and autograph signing sessions! Samuel Adams Sam ’76: Sam ’76 is a revolutionary new beer from Samuel Adams, born out of our experimental Nano Brewery in Boston. It combines the best of a lager and an ale to deliver an unmatched combination of refreshment, craft flavor, and aroma. At 4.7% ABV, Sam ’76 is a refreshing, easy-to-drink beer that’s perfect for a day at the beach, a backyard barbecue, or an all-day music festival. Be sure to make Sam ’76 a part of your Welcome To Rockville weekend! For more information on all our beers, please visit: http://www.samueladams.com. Zippo: Zippo Encore will be back in action at Monster Energy Welcome To Rockville with a full stock of Zippo lighters, including limited edition festival designs! Come by and check out their contests and giveaways or get a free lighter fill or tune-up. Be sure to bring your Zippo lighter to the festival, it could be your ticket to special experiences. SWFTCharge: SWFTCharge provides a quick, portable and convenient phone-charging service for large-scale venues. Their mission is to eliminate battery anxiety in places where it is experienced the most. Individuals purchase the service at a nearby kiosk and leave with a SWFTCharger. The small, compact device provides a quick 40-minute charge of customers’ cell phones. Once depleted, the SWFTCharger can be swapped for a new one as often as customers want while they’re at the venue. The Music Experience and The Student Experience: The Music Experience features all the elements that are involved in making music in a professional band setting. The interactive exhibit features guitars, basses, amps, drums, keyboards and electronic gear that are used by today's most popular bands. After laying your hands on the hottest equipment available, you will walk away feeling like a rock star and you may even see one there, too! Thanks to all of our partners. Come and meet your favorite band members from the festival at The Music Experience Tent. You can win free amps, free guitars and get tons of other free stuff as well. Check The Music Experience Facebook page and the festival website for updates, schedules, and interactive artist experiences on the day of the show. The Student Experience offers a unique opportunity for youth engaged in music and art related academic programs. 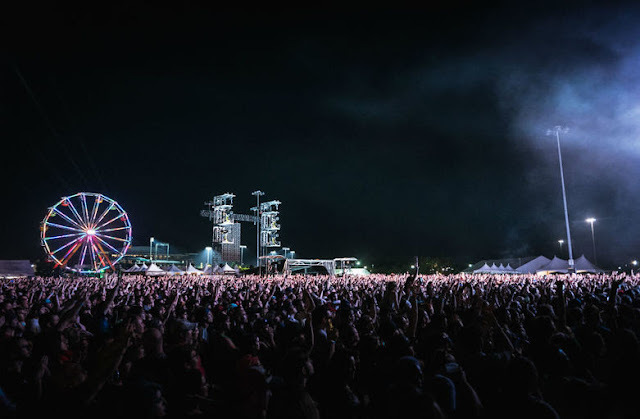 Students, educators, and local unsigned bands gain unprecedented access into and an impressive and inspirational behind-the-scenes look at some of the country's largest festivals. Formed in 1994, Southern CA’s Fearless Records was built on a punk-rock foundation, fueled by a furious passion and the drive to help build the careers of an eclectic collection of on-the-verge artists. The current roster includes some of the genre’s most respected acts, such as Grammy-nominated artists Underoath and August Burns Red, and certified Gold artists I Prevail and Pierce The Veil. The label is also a home to an eclectic collection of on-the-verge artists including Real Friends, Wage War, Movements, The Plot In You and Grayscale, as well as the successful covers compilation series Punk Goes... which has featured such notable acts as All Time Low, A Day To Remember, We Came As Romans, Issues, New Found Glory and Of Mice & Men. Fxck Cancer/Dyin 2 Live: The Dyin 2 Live Dreams Program is a wish-granting organization whose purpose is to try to enrich the lives of those fighting cancer by offering them an experience that will bring hope and inspiration to their lives. In doing this, we hope it can help give them a chance to forget, even if it's only for a day, what they are battling. Through our extensive network of friends, supporters, and affiliates, we are able to reach out to individuals and present them with one of a kind experiences and opportunities that arise. We feel a Dyin 2 Live Dream can offer a source of inspiration for those undergoing difficult medical treatments and be a positive force that offers a life-changing impact not only to them, but also the family to overcome their obstacles. If you are currently fighting cancer or know of someone in the fight who could benefit from a Dyin 2 Live Dream, please submit your story and tell us why and how a Dyin 2 Live day would help. Also, anyone interested in being a supporter, volunteer, or donor, please contact us atmywish@dyin2live.org. Take Me Home: Take Me Home (TMH) has been saving the lives of homeless animals since 2001. TMH was founded as an animal rights advocacy foundation saving orphaned animals and striving to end animal overpopulation. TMH works in conjunction with shelters and rescues throughout California and beyond to help save animals on death row, on the streets, or in unsafe living conditions. Stop by their booth for custom gear and to contribute to a great cause. Jacksonville Jaguars: This year’s Welcome To Rockville features the return of the Rockville VIP Rock N Jock Experience with the Jacksonville Jaguars and Welcome To Rockville performing artist Stone Temple Pilots. Fans will have the opportunity to meet the band at Welcome To Rockville and get a VIP experience provided by the Jacksonville Jaguars at the festival and at the 2018/2019 game of their choice (subject to blackout dates/playoffs). Monster Energy Welcome To Rockville is produced by Danny Wimmer Presents, a producer of some of the biggest rock festivals in America, including Rock On The Range, Monster Energy Aftershock, Louder Than Life, Monster Energy Fort Rock, Monster Energy Carolina Rebellion, Chicago Open Air, Bourbon & Beyond, Monster Energy Rock Allegiance, Northern Invasion and more. Monster Energy Welcome To Rockville kicks off the annual World's Loudest Month festival series. Monster Energy Welcome To Rockville is fueled by Monster Energy. 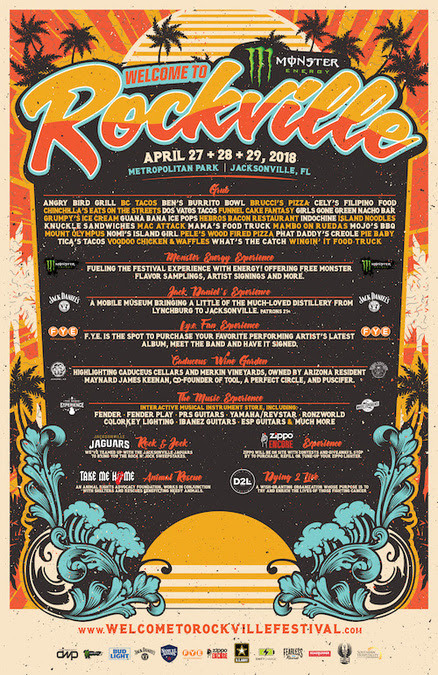 Additional 2018 sponsors include: Bud Light, North Florida Sales Distribution, Samuel Adams, f.y.e., Jack Daniel’s, Zippo, SWFTCharge, The Music Experience, The Student Experience, US Army, Fearless Records, Roadrunner Records, Fxck Cancer/Dyin 2 Live, Take Me Home, Love Hope Strength, Jacksonville Jaguars, and Southern Hospitality Concessions LLC.